Make It Rain | gURROO - A new generation of innovative minds. The conventional notion of “virtual reality” is that of a visually stimulated technology that creates the perception of viewing a “new reality.” This can be seen with the development of virtual reality technology in the Oculus Rift and HTC Vive. While this groundbreaking technology has infinite possibilities, it still doesn’t quite bridge the gap between the physical world and the virtual world. MAKE IT RAIN challenges the conventional notion of “virtual reality” by proposing that a “virtual” space doesn’t necessarily need to be purely an ocular experience, but rather, a “virtual” space is one that challenges the status quo. 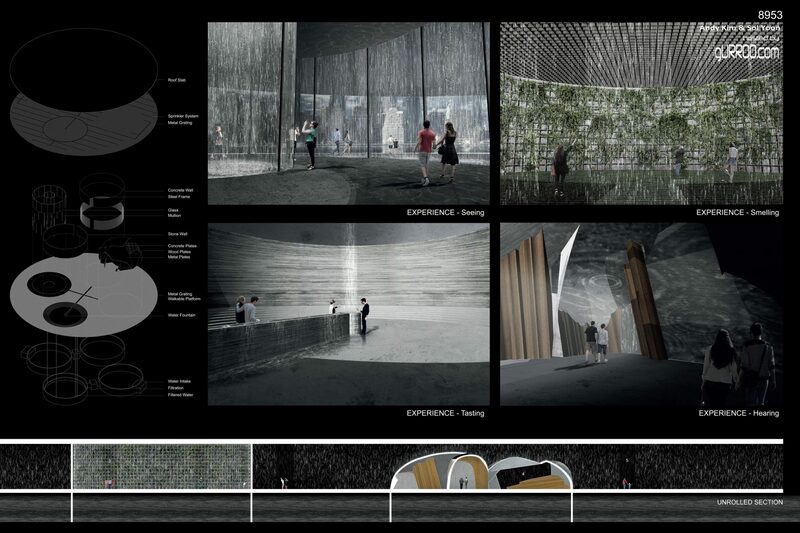 This project aims to manipulate the experience of an element that evokes continuous change and fluctuating emotion: rain. Rain as an element is an intrusive force that has forced humanity to develop means in combating the harsh climate rain evokes. MAKE IT RAIN isolates the five senses of hearing, touch, sight, taste, and smell of rain and aims to create a unique experience of rain that hasn’t been felt before. By isolating each of the five senses, the experience of rain changes and thus the meaning of it changes, ultimately creating a new “virtual” experience of rain. Touch: Uses motion tracking cameras that senses people, turning off rain sprinklers. This creates a buffer zone for people to walk in the rain without touching it. Sight: Frames rain in isolated glass containers that mute the sound of rain hitting the glass. This creates a purely visual only experience of rain. Taste: Using filtered water, a stream of water is pooled at a fountain to taste the rain. Smell: By taking advantage of the process of petrichor (rain hitting dry soil and plants, emitting an odor into the air), one can experience the smell of rain. 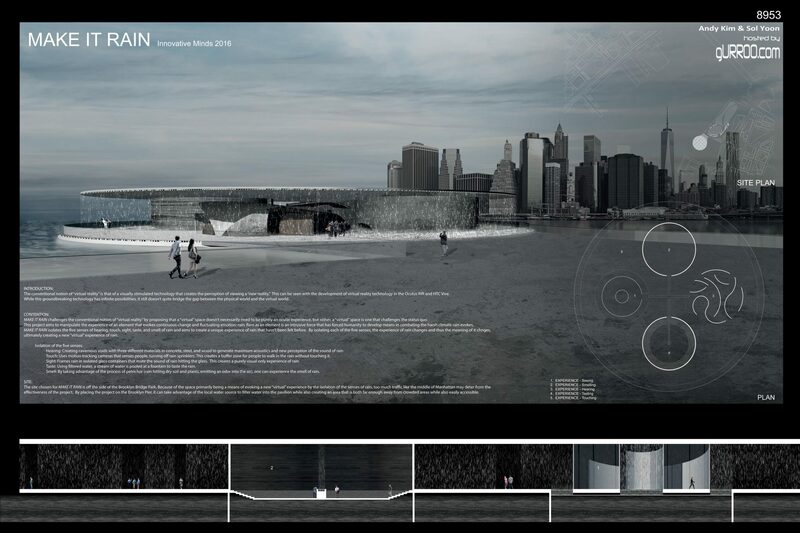 The site chosen for MAKE IT RAIN is off the side of the Brooklyn Bridge Park. 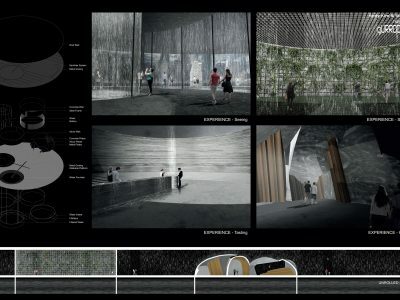 Because of the space primarily being a means of evoking a new “virtual” experience by the isolation of the senses of rain, too much traffic like the middle of Manhattan may deter from the effectiveness of the project. 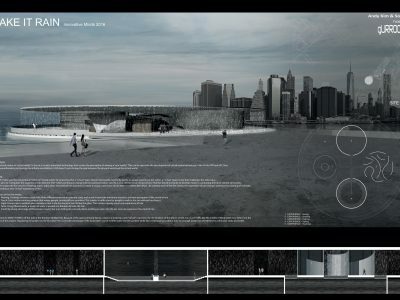 By placing the project on the Brooklyn Pier, it can take advantage of the local water source to filter water into the pavilion while also creating an area that is both far enough away from crowded areas while also easily accessible.